Yesterday, the First Lady announced an ambitious initiative designed to “eliminate childhood obesity in a generation.” Her nationwide campaign, entitled “Let’s Move,” was kicked off with a presidential memorandum that established a plan to evaluate and coordinate public and private services, and to improve health information so that parents can make better decisions about their children’s diets. In a news conference announcing a multi-agency task force, Michelle Obama explained that our children aren’t responsible for the epidemic that confronts this country — 1 in 3 children is considered obese, while this country spends $150 billion each year treating obesity-related illnesses. Michelle also explained to reporters that the idea for the program came to her as a response to advice from Sasha and Malia’s pediatrician, who suggested that she “…might want to do things a little bit differently.” After all, Michelle Obama reminded viewers, it is parents who are responsible for making healthier food choices available and appealing to youngsters, and who can and should encourage kids to spend less screen time, and more time engaged in physical activity — preferably outdoors. I wasn’t surprised at all by the First Lady’s commonsense approach to today’s confusing health messages, food labeling chaos and the dearth of wholesome, fresh food in some urban communities — what she called, “food deserts.” Michelle descends from a legacy of women who made survival in difficult times an art form. We are all busy. Food portions are huge. Chemicals and artificial ingredients are hidden from view. And, yes, sugar is everywhere. But that does not mean we have to live as victims. With inspiration from our foremothers, we can choose dietary balance and moderation without resorting to packaged, artificial foods for convenience. Just consider the focus, and imagination of slave cooks, unable to read or write, as they performed multiple tasks at one time, and demonstrated remarkable feats of recall, memorizing dozens of English recipes as they prepared meals in Big House and cabin kitchens. In a patriarchal system that didn’t even offer slave women control over their own sexuality, choosing a particular food, and a particular means of preparation, contributed to their sense of self-esteem because it offered them a small element of control. These women managed to maintain vestiges of their African cultural past while preparing meals for the master’s family and their own without the constant eye of the “missus” looking over their shoulders. We can live with minimal exposure to the world’s apple, too. The traditional view of a slavewoman’s responsibility for preparing and serving meals in her master’s hot cookshop mirrored her image as a lowly servant charged with the most onerous and arduous tasks of the household. But, the role of food and cooking took on immense cultural and ideological significance when she returned to the privacy of her home in the slave community. Like French chefs who recalled their “old ways” when dealing with unfamiliar foodstuffs and working with “inferior substitutes” following wartime, slave cooks, applied “African grammar – methods of cooking and spicing from remembered recipes, and ancestral tastes to the grains, fruits, vegetables, meats of the New World,” says historian Charles Joyner. They demonstrated technical knowledge and skill, took their time, and followed directions with discipline and order. Food rations varied little from plantation to plantation – cornmeal, pork fat, molasses, and sometimes coffee, depending upon the master, making food collecting a necessity slave women turned into a luxury to maintain cultural continuity with Africa. All across the south, black cooks enlivened the family’s monotonous diet, before and after their work day by hunting, fishing, crabbing, oystering, clamming, foraging for wild nuts, fruit and vegetables, and gardening in small plots. They evaluated the quality of ingredients at their disposal and determined their flavor profiles. They considered how one food might work with another according to taste, aroma, and appearance. They understood the importance of food safety and maintaining freshness, and identified the proper way to store and hold various ingredients. And, they relied upon rudimentary tools such as mortars and pestles to pound out “sarakas” flat rice cakes. Slave women also applied classic techniques (like those taught in today’s culinary academies) to common ingredients. They supplemented meager stocks and broths with fresh meat scraps. They braised meat bones and aromatic vegetables into stews; roasted wild game; stewed wild leaves and greens; thickened meal into mush; preserved seasonal fruits into jelly, substituted sweet potatoes for rice, cured ham. They coped with the differences between “tenderness and putrefaction;” understood timing, frying, poaching, sautéing, galantines, fermentation, custards, and forcemeats. 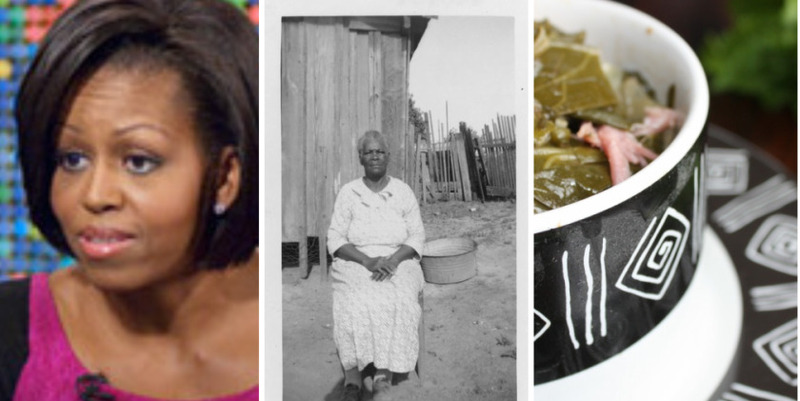 Michelle Obama’s new initiative doesn’t tell us exactly how to improve our health and slow the pace toward obesity, but even casual observers can see some clues in our ancestry: Simple, fresh ingredients. Plucked from the garden. Made from scratch. Following standard techniques. Spiced with cultural seasonings. Portion control. What were some of your mother’s food rules? “Clean your plate; eat your vegetables?” Click Comments below to share them with us. Bring water, turkey, onion and garlic to boil in a large kettle, then reduce the heat and simmer 20 minutes. Meanwhile prepare the greens. Cut off and discard about 4 inches of the stem. Stack 5 or 6 leaves, roll up, and slice greens into 1-inch strips. Roughly chop, chopping stems more than the green tops. Add greens to the turkey broth, cover, and cook over medium heat about 2 hours. Season to taste with salt and pepper. our first step is to improve the quality of food served in the public schools, and the best way for this to happen is for parents to pay closer attention to what their kids eat. we also need to get the city/state/federal governments invested in providing meals of a better quality ( for too many children, subsidized meals at school are the only regular meals they get. those meals should be nutritious in addition to being filling. improved food quality has been achieved in other cities with corporate/local government partnerships funding the availability of fresh foods. it takes a village to raise a child, but it takes a community of people who DON’T have children working with parents who DO have them to impress the powers that be on community concern. the question then becomes “who cares enough to take this on”? parents — you listening? CEOs — you listening? community activists, you listening?